We are happy to inform you that the big international orienteering event of MOC – Mediterranean Orienteering Championship 2019, organised for the first time in Malta by Park World Tour Italy with the cooperation of the Maltese Ministry of Education and Sport, FISO – Italian Orienteering Federation and IOF – International Orienteering Federation, with the intent to promote and support the development of orienteering in new countries, is now valid as WRE – World Ranking Event! Are you already registered? You can now check your info! This year unique MOC Tour, will lead you through the Mediterranean area starting from Malta, cruising through Sicily, and continuing to Calabria and Campania, has only 10 available places left! Pompei is a breathtaking archeological site (UNESCO) laying under the majestic Vesuvius volcano. The extra trip to Pompei will be organized for those participants of MOC tour 2019 desiring to visit it, on Friday morning, March 22nd. Departing from Paestum’s hotel at 8.00am, arriving in Pompei archeological site at 9.30 am. 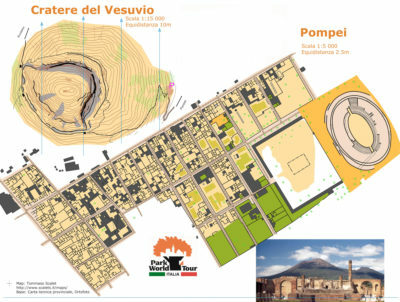 Departure from Pompei at 13.30 with arrival directly to the Ascea (1st stage of the MOC weekend). Ticket costs and extra trip to Pompeii will be quoted separately from MOC tour package.